Even though we have some disadvantages from our relocation, there are few notable advantages I can see in my girls. First thing is they have started saying Prayer every day which they never used to do when we were in US. Another one is eating vegetables. Since we live in Delhi right now, kids here bring some dry vegetable curry as side dish I believe (I am assuming they eat it also).So one fine day, my girls asked me to make side dish for their Chapathi which they used to take for lunch. Before I used to make Vegetable chapathis for lunch. But now a days I have started preparing side dishes instead of veggie chapathis. This is one kind of dry curry I made day before yesterday for their lunch. Microwave chopped potato, carrot and peas in a safe bowl for 6 mts or till its done. 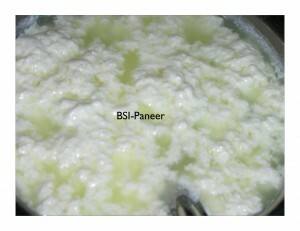 In a pan, pre heat a drop ofghee, and fry the paneer pieces to golden brown. Keep it aside. Now add the remaining ghee, splutter ajwain and fry green chillies (I removed the green chillies after the curry is done cooking). Fry the chopped onion till it becomes transparent. Now add the cooked vegetables along with required amount of water. Add turmeric powder and salt and let it cook for another 3 to 5 minutes. 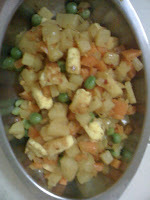 Add the fried paneer pieces when the water is almost dry and mix it along with other vegetables. Garnish it with coriander leaves. I am sending this recipe to Jay's Letz Relishh - Paneer Event. Nice recipe,would be great with roties! very healthy and delicious curry..easy to make too...visit my site whenevr..
Thanx dear for this delicious entry...! Dry curries are really wonderful to go with lunch pack. Very nice recipe dear. Its always a pleasure to cook which our kids like or they specifically ask us. dry curry looks yummy with the addition of paneer in it.